On Tuesday, two volcanoes erupted to life in Indonesia, killing at least two people, injuring others and forcing the evacuation of thousands. Mount Bromo, a popular tourist attraction on Java about 700 kilometers from Jakarta, suddenly ejected large rocks and ash on Tuesday. Smoke plumes reached at least 3,000 meters above the 2,329-meter-tall volcano, according to the Associated Press. Mount Bromo is still rumbling and smoking, but less strenuously than yesterday, reports say. The two people who are confirmed dead were tourists who were hiking in the national park, which is now closed; rescue teams have ascended the slope to search for other hikers who might be trapped. Officials, however, have not yet evacuated the volcano's surrounding villages. The volcano has long been historically active, but large eruptions are rare. Indonesia is one of the world's hotbeds of volcanic activity. The island nation is host to more than 100 active volcanoes, two of which roared to life on Tuesday. Large red triangles show volcanoes with known or inferred Holocene eruptions. Photo courtesy of Global Volcanism Program. Meanwhile, Mount Awu on Great Sangihe Island in the far northwest of Indonesia about 2,250 kilometers from Jakarta, also erupted on Tuesday in a series of small blasts, followed by a large eruption of hot ash, according to Reuters. The ash and smoke column, now 2,000 meters high, forced the evacuation of more than 10,000 people living in small towns in the volcano's shadow. The 1,320-meter-tall volcano has historically been one of the deadliest in Indonesia, according to the Smithsonian/U.S. Geological Survey Global Volcanism Program. Since 1711, five explosive eruptions at Mount Awu, including the most recent in 1966, have killed more than 8,000 people. 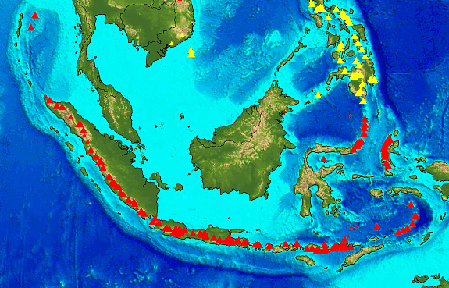 Indonesia sits atop the seismically active Pacific "ring of fire." The country hosts more than 100 historically active volcanoes  more than any other country  and has more people living in close proximity to active volcanoes than anywhere else on Earth (Geotimes, April 2004).